Joint operations are not a new concept here. It’s a way of life for many units on base. But for a new breed of ​Air Force joint operators, this week’s Joint Forced Entry Exercise was a chance to get off the ground -- literally. The Airmen are part of Rapid Engineer Deployable Heavy Operational Repair Squadron Engineer units, better known as Red Horse. They are from Nellis Air Force Base, Nev., Hurlburt Field, Fla., and Langley AFB, Va. Their task is to quickly assess and repair runways. But unlike other Red Horse teams, these Airmen parachute into the fight with the Army. 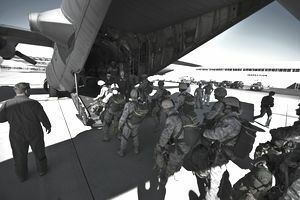 The airborne Red Horse team’s objectives during the joint exercise are to participate in an airfield seizure with Soldiers from the 82nd Airborne Division at Fort Bragg, N.C., and then clear and repair the airfield alongside Army engineers. Their work will prepare the way for C-17 Globemaster IIIs to land, bringing in support and supplies to operate the air base. The exercise is a model of what the airborne Red Horse teams will be doing in the near future. “These guys would be at the point of the spear,” said Maj. Kevin Brown, chief of engineering for the Army’s 82nd Airborne Division. “When they parachute in, they don’t have the luxury of having the security police or having other assets that are normally associated with a developed airfield. They are going out into the woods, into an undeveloped or remote airfield, and basically relying on their own survivability and field craft skills along with their technical engineering skills to get the runway going." Red Horse units activated in 1966 during the Vietnam War when Secretary of Defense Robert McNamara asked the Air Force to develop its own combat construction team. They are trained to be a self-sustaining force in remote, bare-bones and possibly high-threat environments at any time, in any place and with any branch of the military. Their specialty is runway and ramp construction, maintenance and repair. Thanks to the team's flexible nature, they can fill virtually all bae civil engineer roles. Previous tasks have included renovating living quarters at former Taliban bases in Afghanistan, building fire stations and hangars, rewiring air traffic control towers, building laundry facilities and even paving basketball courts. Red Horse's flexibility and diversity have made them a natural choice for the new concept of airborne civil engineers. The airborne RED HORSE was stimulated by the vision of the Chief of Staff, Gen. John Jumper, based on his experiences in U.S. Air Forces in Europe, and three teams were established in 2002. Airborne RED HORSE teams are significantly different than the rest of traditional RED HORSE combat engineer squadrons in that members are airborne qualified and use much lighter specialized equipment. ARH team members also attend a 13-day Army Air Assault course to learn how to sling-load their equipment and rappel from helicopters. ARH teams take 21 traditional RED HORSE members and augment them with six firefighters, six explosive ordnance disposal technicians, two chemical and biological readiness experts, and security forces personnel, as needed. The men and women who make up an ARH team volunteer from within the traditional units and have to be physically qualified. While the program has been developing over the past few years, the Airmen have been training. They have attended the airborne school at Fort Benning, Ga., and have been learning the tactical skills needed for them to be ready to work alongside their Army counterparts. “How many guys in the Air Force get to do this?” asked Staff Sgt. Mark Gostomski, 99th Civil Engineer Squadron, one of the 33 Airmen participating in the exercise. “The Air Force brings a wealth of experience and knowledge in airfield repair and airfield construction. We also have a wealth of tactical knowledge, so we’re basically melding the two into a joint collaboration of effort,” Major Brown said. The idea is not to take over any of the jobs the Army already has within their units, but to augment those units with Air Force specialties. Although the Airmen said the differences between the Air Force and Army cultures can make working together a challenge, they also said the outcome is well worth it. What Is the Phoenix Raven Program? What Is Considered Fraternization in the Air Force?